I have just got 2 colonies on 6 Zander (452 mm x 220 mm) frames each full of brood nests and 1 colony on German national (370mm x 223mm) full of brood nest as well. Have you ever tried successfully transferring brood frames to a top bar hive without the chop and crop method (I tried this May but it was more of a kind of massacre because I had to cut through so much brood nests leaving lots of small triangles with brood to be squeezed into a hairclip in order to fix them to a top bar). this is my first experiment transferring frames (Zander) to my TBHs by using the smallest supper (1/2 frames size). The supper with 6 brood frames and two follower boards inserted sits on top of my TBH with top bars to the left and right of my supper (some have small alread built combs). I am excited to watch whether the bees will move downstairs. I have nice pictures to share but can't see how I can upload them here in the forum. I would think the best thing to do might be to leave on frames in hive until the spring and then do a shook swarm into a tbh? Summer's a long way from over but colony sizes have peaked and bees will be starting to prepare for winter. If lots of comb is broken during the transfer it might seriously harm their chances of overwintering. 1 - shook swarm into the topbar hive. transfer all flying bees, by substituting hive location, some or all comb bees and the queen to the top bar hive. At the end of spring is the ideal time for this as there is little or no brood. Doing this now would require either ditchin all the brood (poor bees) only maintaining the nuc to raise an emergency queen. 2 - comb substitution. The top bars should be the same length as the frames so you insert empty bars between brood frames and they will draw them out. As the current frames are capped moved them to the outside so they are only filled with honey, perhaps behind a queen excluder. When the frame is empty of brood remove it and add another top bar. You must take care not to let the natural comb extend behond dimensions of the topbar hive but a little trimming is fine. 3 - chop and crop. An extreme and immediate approach and not to be attempted alone. You cut the frame from around the outside and trim the comb to the dimensions of the top bar hive using a follower board as a template and a bread knife to cut. You then screw a full top bar onto the frame top bar and put it in the hive. 4 - growing the colony down or up through nadirring or supering. This works on the idea that you produce another box for the bees to expand into. This almost never works and is too late in the year now anyway. 5 - converter hive. Build a hive that is half national half topbar. Allow them to grow horizontally into the topbar hive and when the queen crosses over to lay on the natural comb slot a queen excluder between the two. Remove the frames as the brood emerges and feed in topbars. Option 5 the converter hive turned out to be easier than I thought. The night I sent this email I put a follower board into a national brood box and drew a template. I then attached to thin pieces of ply to give the sloped profile. The box now take 6 national brood frame and 6 topbars (36mm wide). Da daaa! converter hive. Posted: Wed Mar 02, 2016 10:42 pm Post subject: TBH as converter hive? as my source of bees will give me five Zander frames "soon" I built a simple adaptor for putting up to five frames into the TBH, which will keep the frames in the middle, square angled to the top bars, and some triangular things left and right to the frames to prevent wild combing. There is enough space for five frames,. Has anybody tried it that way? May a queen excluder helpful to motivate the bees sideways to the top bars? Or did I just waste some wood? The forum will not let me post image-URLs in my first posts, so I put two Dropbox links in my profile - is there another way to show pictures? Hi RalfK and welcome to the forum. I believe that others have tried setting frames in a TBH at right angles to the top bars and the bees have swarmed rather than expand onto the top bars. The problem seems to be that the queen will not move from that brood nest section into an adjoining section, even if you can get the workers to build comb from the top bars.... and if you move the queen, it may be that the nurse bees on the frames will raise emergency queen cells because, as far as they are concerned, the queen has been lost, as she is no longer laying in the "brood nest"
I know that set up seems like it is an ideal solution to the problem from a beekeepers perspective but unfortunately the bees don't seem to see it that way. If you look at AugustC's post above it gives the alternatives that work, but feel free to persist with your method if you wish and perhaps it will work for you, but be prepared for them to swarm. Thanks Barbara for the quick response. My hope was that a horizontal move would be more feasible than a vertical / downwards move. Persisting with a dysfunctional solution is not on my wish-list, so I may build a converter hive instead to keep the brood frames, or just shake the bees into the hive and loose the brood. People have struggled to get them to move down as well as horizontally, particularly if you are unable to move a brood comb down into the box below. If you are going to do a shook swarm, you might as well do the chop and crop rather than ditch the brood altogether. It may seem brutal to the beekeeper to cut through some of the brood (as the Original Poster of this thread described) but most people who have done it find the bees cope very well with it and recover pretty quickly.... certainly faster than taking all their comb and brood. They are also less likely to abscond if they have some of their brood nest in the hive. Personally I only work with swarms and cannot recommend them highly enough. When I started in July 2013 in my ignorance I just put the nuc. frames at an angle below the top bars nearly at right angle and they built comb and started on the bars in 24hrs. The entrance was reduced to one hole and they were fed 1:1 syrup. Not all the brood survived as they abandoned some as they and the queen moved to the new comb. I removed the nuc. frames after 4 weeks which were a bit messy which my friend who supplied them did comment on as he had not seen anything like it in 68 years of beekeeping. They made a bit of messy cross comb near the nuc. frames which I was not able to sort out till after the following winter. They have continued and I have two hives now and two new topbar nucs. and two Warre hives for expansion this year. Well there you go..... someone that it did work for, just to balance the argument and prove that there is no right or wrong way. Martin, congratulations on the obvious success you are having with your bees and thanks for contributing to the discussion. Good luck populating those Warres this season. My attempt with a converter board holding the Zander frames did not work. The bees ignored the top bars completely, even after I put some udes top bar just in front of the zander frames. So I put zander frames into a nuc box, set some top bars beneath the frames and waited. The bees built fine comb under the top bars, so I was able to move those six top bars into the TBH - just had to chop some edges off. Lesson learned. The next TBH will be populated via a shaken swarm. The other method is a chop but with much less crop. Cut pieces of chicken wire about 200 x 100 and trim the short ends so it is spiky. Staple them centred under plain top bars or fold them over the top with no staples. Cut the comb to the approx x section of the TBH and fold the wire down each side and push the spikes into the comb to hold it in place. As most of the brood is in the middle of the comb little is lost. Worked for me transferring wild comb. Made these today in preparation of a chop and crop from a National with help (boy do I need it) on Tuesday. To get the width I used another top bar 7/8" wide to fold the chicken wire, as a former. You might consider folding the sticky up bits in at 90degrees and opening the gap a bit so you can just close it over the comb and it will stick into it without messing about. If the combs are very heavy I suppose it might be worth considering two layers with the outer one lower down to give two lots of support. Yes I did bend the ends on two of the top bars after I took the photos, only a few degrees. But 90 degrees and opening the gap is a better idea, cheers. 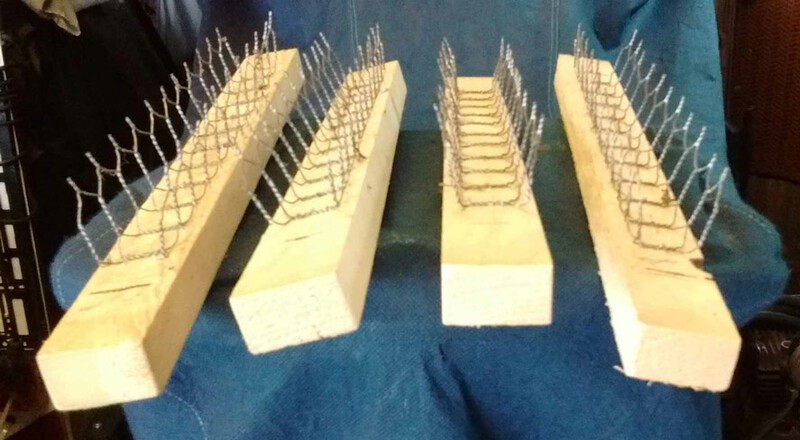 Garden wire to hold comb in, but all the way around top bar and comb with a wooden brace (cannibalised from the brood frames we were transferring from) across the bottom so the wire didn't cut through the comb. Very messy, but worked very well, with 95% of brood saved. Once the bees had fastened every thing in we snipped wire and removed brace. If the combs are really heavy you can cut some short lengths of thin hollow bamboo, push them carefully through the comb near the bottom and support them with a couple of bits of garden wire over the top of the bar too. The couple of wild combs I did I haven't bothered removing the wire at all. I'll do it when I have to. I have had success using masking tape. You create girdle or swing for the comb with it extended up over the topbar. The bees attach the comb and then chew off the masking tape and remove it themselves. The emerging brood can even get through.